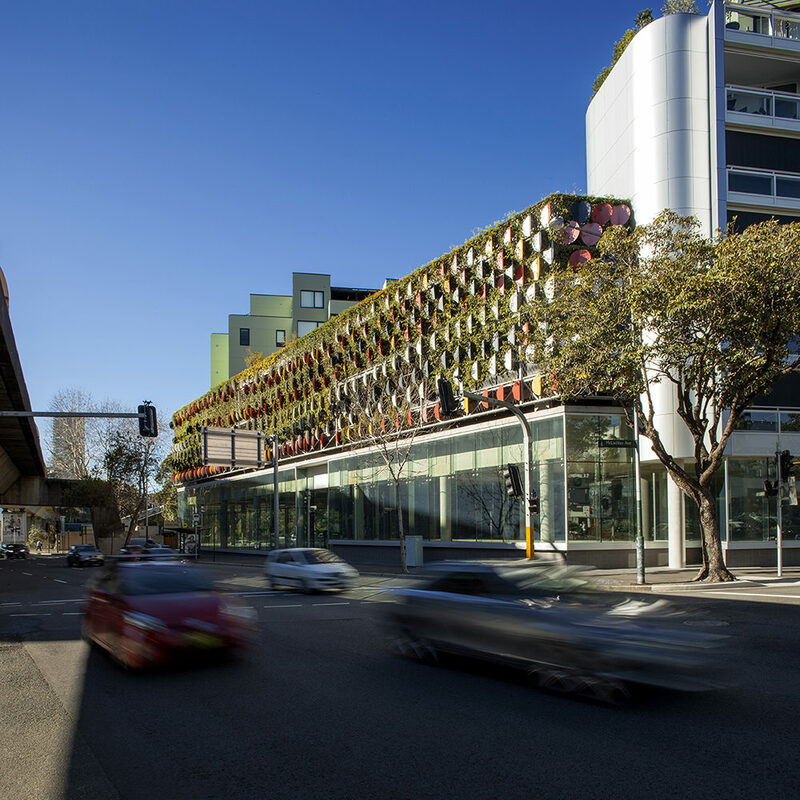 Tensile Design and Construct recently collaborated on a project that involved building a green facade 8m high by 90m long, covering three levels of the Podium Car Park for a new luxury apartment building in Rushcutters Bay, Sydney. The project shows off the great aesthetics that can come from a green wall system, as well as the innovative solutions and architectural finesse that were needed to make the job a success. Tensile managed the entire project from concept to completion. As an architectural solutions company, it undertook the design work, structural steelwork engineering, fabrication, co-ordination of the artist’s work installation and the final installation. Tensile’s founder, Peter Bottero, says they got involved when plans for an underground car park were put in the ‘too-hard-basket’. Tensile was able to offer unique solutions to the architectural challenges that arose, particularly through the use of lightweight tension products. We were approached to be part of a team involved in the construction of the car park for the Advanx Apartment’s development. Tensile Design & Construct joined forces with the building team from FDC Construction & Fitout Pty Ltd and DJRD Architects to build an above-ground car park. 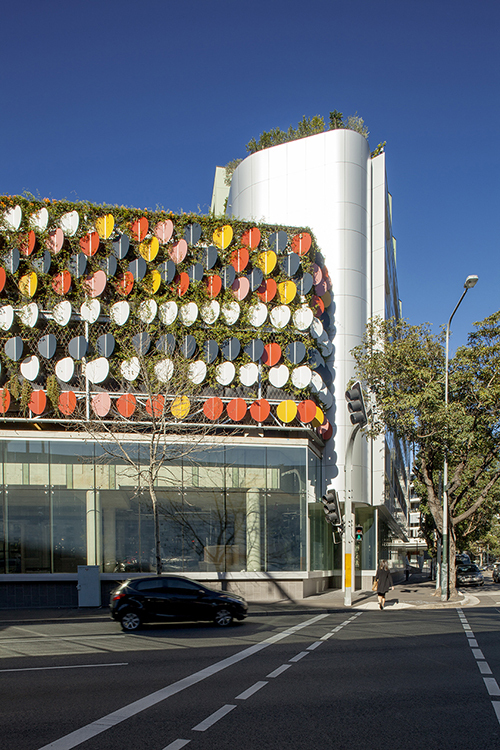 Located in a busy inner-city area of Sydney, it was agreed that the car park needed to look good but not blow the budget. The initial structural design of the facade prior to Tensile’s involvement involved having steel posts spaced around 1.8m apart with infill between the posts. Tensile redesigned and reconfigured this element to create a lightweight, economical solution using their custom Webnet mesh. The steel posts were pulled out to a distance of 8m and the mesh was installed between them. The Tensile product used was Jakob Webnet Mesh, a stainless steel tensioned mesh that is designed to be incredibly strong yet flexible. Tensile’s solution to the steel posts resulted in a saving of more than 60 tonnes of steel. Compared with the original design, this also included a massive financial saving and the project was completed sooner than originally expected. 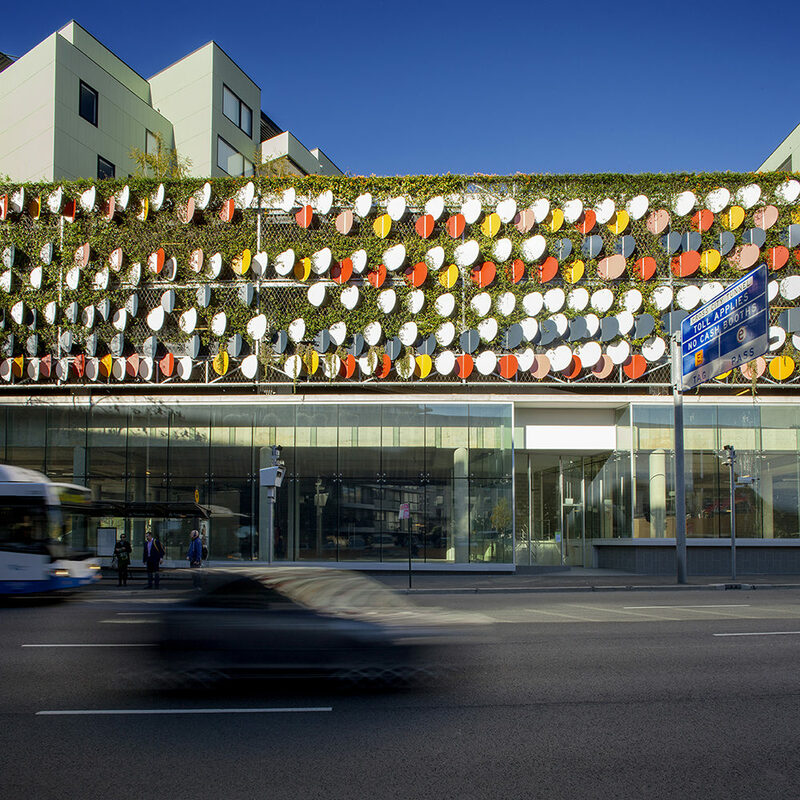 The design of the green facade complied with some important specifics relating to car park building code. 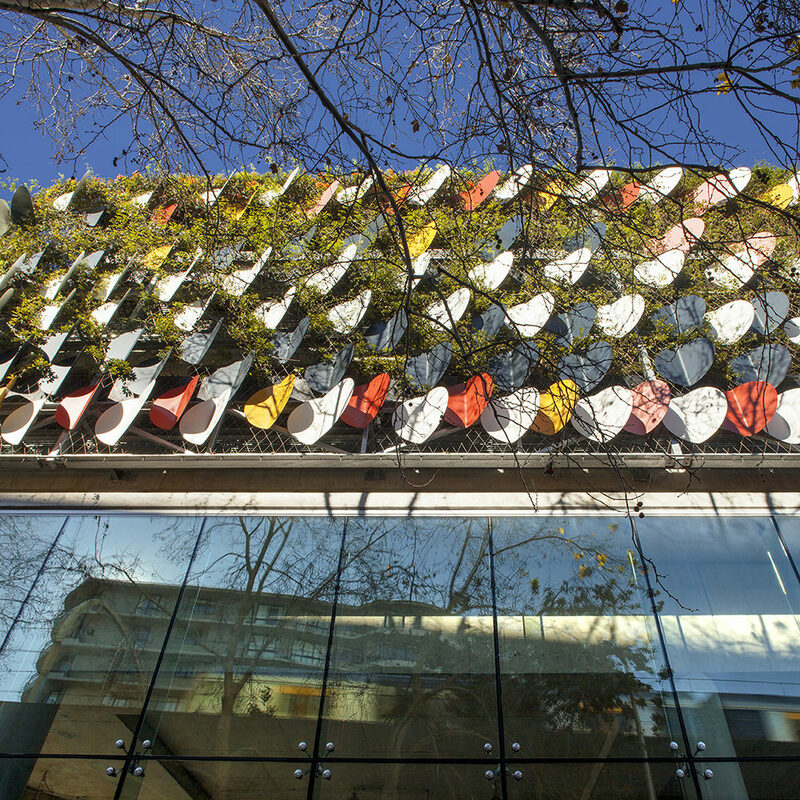 One year after completion, the climbing plants now housed on the mesh had fully grown, adding to the car park’s aesthetic appeal. The entire structure hangs off the side of the building, and no modifications or additions were required for Tensile’s design. Due to the flexibility and customisation of the mesh, we were able to work with what was already drawn. With structural installation completed in under a month, the final outcome was a cost- effective screening element that met the requirements of both the builder and the developer, and in so doing achieved significant cost savings by reducing the amount of steel first thought would be needed by about two thirds. 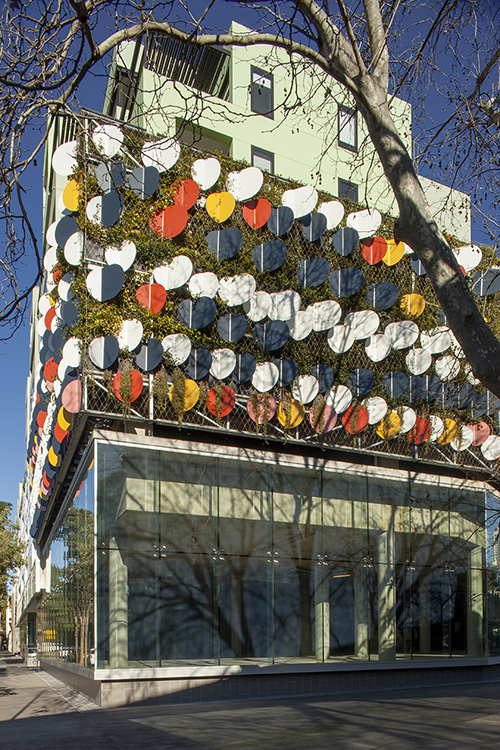 The cooling effect of green wall thanks to solar shading is another key outcome of the installation. 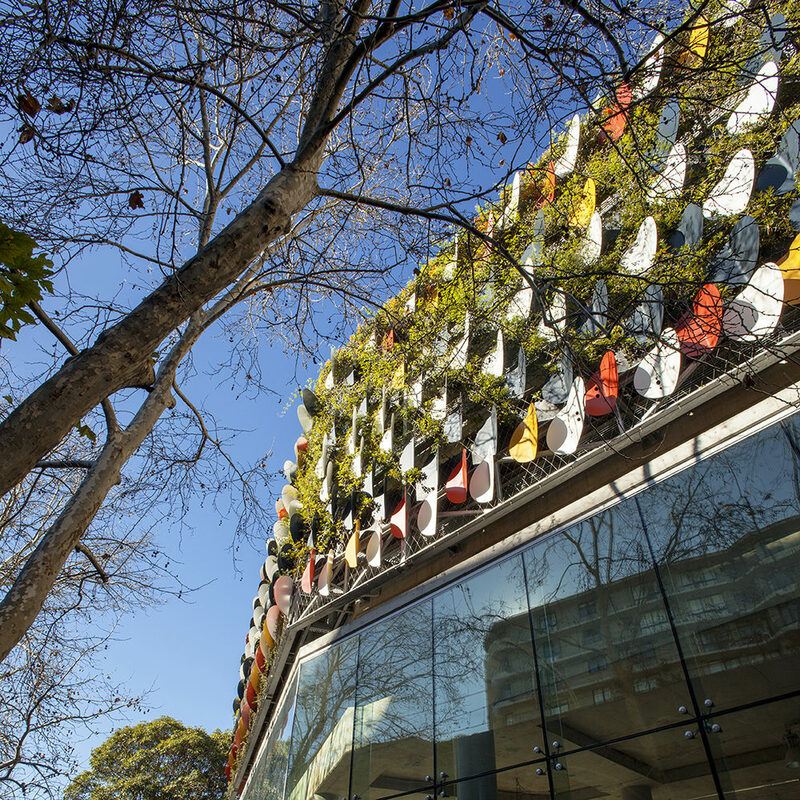 Reports indicate that a green façade with 70% coverage of leaves for each square metre can offer a 90% reduction in long wave radiation, so there are clear environmental benefits. A key challenge, however, was to integrate an artwork component into the design. The work, titled The Footprints by Korban Flaubert, was a nod to the original dirt track used by Aboriginal people in the area. The weight of all the artworks was three tonne across the façade, and is easily held by the strong cables. At Tensile, we are inspired when we work on new and interesting projects. To see more of our work, click here.